A Eurasian species of local occurrence. 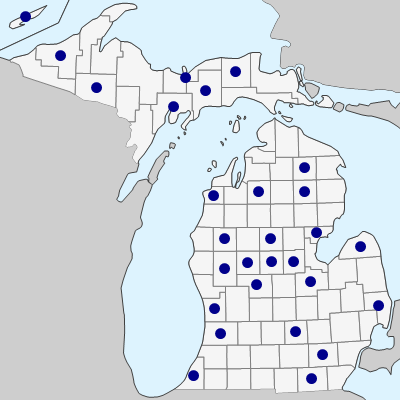 A lawn weed in Ingham and St. Clair Cos. in the 1880’s, but except for a 1935 collection from Ann Arbor (Washtenaw Co.), not gathered again in the state until 1978; since, apparently spreading (or being discovered) rapidly along roadsides and in lawns, fields, plantations, vacant lots, logged areas, gravel pits, and other disturbed sites. Good magnification (20–30×) and illumination at the right angle are often necessary to see, on the inside of the phyllaries, the distinctive tiny hairs that will identify this species and C. biennis if achenes are not mature. MICHIGAN FLORA ONLINE. A. A. Reznicek, E. G. Voss, & B. S. Walters. February 2011. University of Michigan. Web. 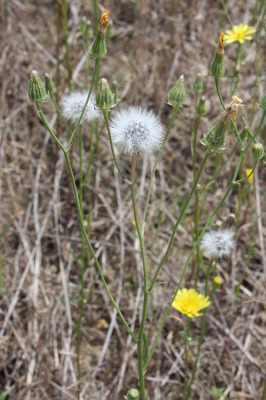 April 21, 2019. https://michiganflora.net/species.aspx?id=305.